It’s not easy being a neutrino physicist. The ghostly nature of the neutrino makes discovering new processes and physics involving it one of the toughest challenges in science today. It’s also one of the keys to advancing our knowledge of the universe. This challenge has been accepted by many collaborations across the world, and one of them is GERDA, (GERmanium Detector Array) in the hunt for discovering neutrinoless double-beta decay. That sounds a bit counter-intuitive. If neutrinoless double beta decay is observed, it could provide a wealth of information about the neutrino. This is because the neutrino mass depends on the half-life of this ultra-rare decay, and importantly the existence of the decay would also show the neutrino to be a Majorana particle – that means that it is its own antiparticle. But, we’re still in the chase for this elusive decay, and that’s where our image of the week comes from. GERDA simulated background model. See figure 4 in the paper for further details. 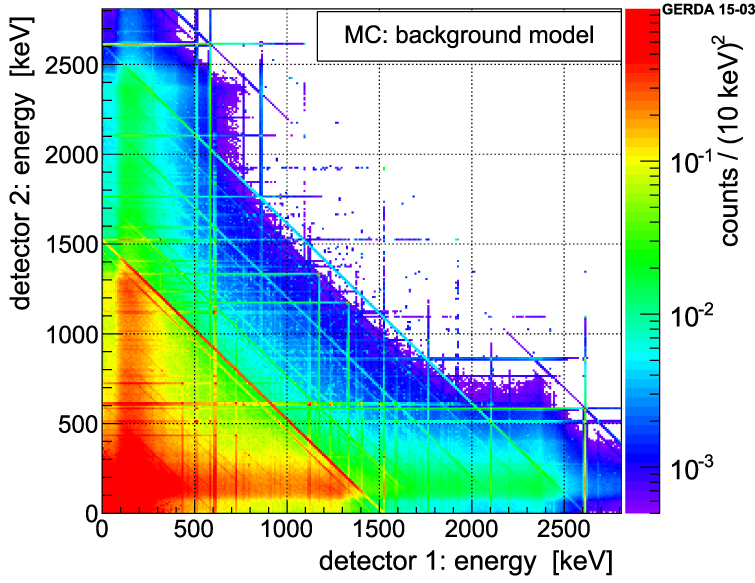 In a recent paper in JPhysG, the GERDA collaboration hunt for two-neutrino double beta decay in 76Ge, an extremely rare (but slightly less so) requirement of the neutrinoless decay, as described in the author’s LabTalk article. Nothing comes easy though, and the results proved to extend the chase, with the lower bound of the decay’s half-life now thought to be over 1023 years. By comparison, the team have recently placed lower bounds on the neutrinoless version at over 1025 years. So what’s important about our image? Well, GERDA has ultra-sensitive detectors to pick up ultra-rare decay events. Unfortunately, most of the signal comes from known background decays which could mask the appearance of the target data. This makes it crucial to understand how to bring the data out from this to raise the sensitivity as high as possible. The image shows the team’s simulated background model used for this process – without it, no results could be achieved. So the hunt continues. In the future, GERDA is being upgraded to significantly increase it’s sensitivity whilst reducing the background noise by a factor of 10 – we look forward to the results! Paper: The new generation of double beta decay experiments: are there any limitations? Image: from GERDA Collaboration et al 2015 J. Phys. G: Nucl. Part. Phys. 42 115201, Copyright IOP Publishing Ltd 2015.